I woke up today with an upturned sky. 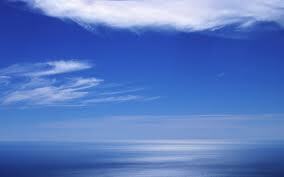 The sky and sea merged and what I saw was an expanse of water, or maybe an expanse of sky. There was no horizon to divide earth and the heavens, infinite silver blue. And there I was, filled with so much promise for the new day. An entire day to create I said. A chance to fix what I failed to do yesterday. Today I will be quiet when I should, and let others be, without judgment or envy. There was no need to prove myself I thought. No showing off. No need to take center stage. No need to bask in the light. And especially, no need to sulk when others took the light. And just right before I stepped out, I thought, no insignificant acts. But an upturned sky made an unturned day. And all my good intentions were whisked away by all the bad temptations. I couldn’t stay where I sat. That or I would once again sulk in my misery. I could not listen. That or I would turn to judgment in my thoughts. And I kept feeling the need to show off. And so I escaped. And kept seeking places of solitude. Breathed in the salt air. Kept going back to that place inside my heart where I should find a higher me. Asked the waters to cleanse away my deep pain, and even deeper longing for some peace within. The sky was stroked with angel wings and I kept looking up, asking for some help from heaven. And I feel wretched. As though I failed my big test today. It’s 2PM and I have another half day for redemption. Here’s another half chance to save the day. The sky’s separated from my sea. And I see a clear distinct horizon. Maybe a normal sky will make a normal day.